Soup is the first thing everyone thinks of when it’s time to help people. Author of the well-received “Man’oushe: Inside the Lebanese Street Corner Bakery,” Massaad took her camera, filled her car with food, and went to the camp often that winter. 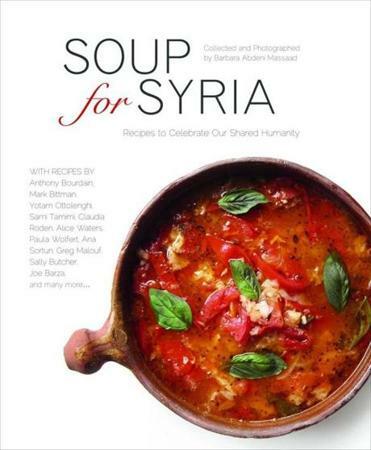 To help the families, she compiled, photographed, and edited “Soup for Syria,” with recipes from 80 chefs, some well-known. Profits benefit the United Nations High Commissioner for Refugees. On Soupforsyria.com, cooks are encouraged to host soup parties and other events to promote sales. This isn’t a book to curl up with. There’s a certain amount of pain as you skim the pages and see photos from the camps, mainly of children, some with piercing eyes that are hard to stop staring back at. There are two boys playing with a stick and a can, several mothers with their young children, a barefoot child standing in front of empty containers and hanging blankets that may be his new home. So while you are cooking, there are desperate faces peering at you. But you’ll find nourishing food here. A Turkish chicken and rice soup, with tomato paste, red pepper paste, and dried mint, served with lemon wedges, is a hearty supper. You simmer chicken legs and use the delicious stock to make the thick soup, a recipe from Turkish author Nur Ilkin, whose country has seen vast numbers of refugees, she writes. No recipes come with intros, so their provenance is unknown. In some cases, you have no idea what you’re about to do. Celebrated London authors Yotam Ottolenghi and Sami Tamimi offer Gondi, an Iranian-Jewish dish often served on the Sabbath, but we’re not told that. Curried cauliflower soup from Jordan chef Sana Wakeem Awad begins with a slim ingredient list — including grated fresh ginger, curry powder, turmeric, and cumin — that adds up to a pretty wonderful formula. The golden bowls are garnished with chopped scallions, all the crunch you need. Lebanon-based culinary instructor Helena Zakharia offers a soup of meatballs and vegetables. Trying to whir 1 cup of fine bulgur into ¾ pound of ground beef seems like it might end in disaster, but it comes together and the balls (something like kibbeh) do not disintegrate in the pot. They are grainy little rounds, first browned, then simmered in a minty beef broth with chickpeas — these don’t take 1 hour, as stated, and you must skim the pot — and peeled zucchini. The soup needs way more water than given, but is a good lesson in how to make meat an accent in the pot. 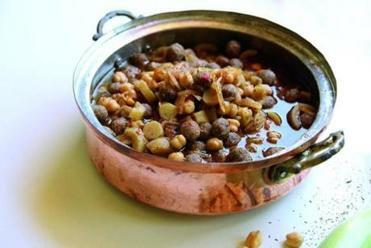 The most appealing recipes are the authentic dishes from regions surrounding Syria. Paula Wolfert’s lemony and comforting lentil and Swiss chard soup, simmered only in water (also more than what’s called for) with cilantro, garlic, and cayenne, is spare; you can imagine it being made by someone who has very little in the larder. A whole cabbage, a cup of fine bulgur, and red pepper paste go into a surprisingly good and very big pot that probably costs $5 to make (add twice the water and double the cooking time). Some recipes may have made sense to the chefs after Massaad’s shout-out, but seem odd in context. They’re too luxurious or the cuisine is out of place. I couldn’t muster interest in Anthony Bourdain’s French vegetable soup with pistou (like pesto). Alice Waters phoned it in: carrot soup with a suggested garnish of whipped cream or creme fraiche seasoned with chervil, chives, or tarragon. Also odd: Mark Bittman’s Korean-style pot (run opposite a photo of a Syrian man holding his sweet toddler), Thai coconut soup, Caribbean fish soup. Cook from this book and you feel like you’re feeding those children. When the Berlin Wall came down on a chilly fall afternoon in 1989, I happened to be making lentil soup. Later I heard that after East Berliners had been streaming through the wall for hours, townspeople in West Berlin set up a soup kitchen. Lentils were ladled into the bowls of the hungry.